Power Inverter to run boiler? Here in Chiberia, I'm thinking I would like to be prepared for a power outage in the bitter cold by being able to run just the boiler - electronics, 3 zone valves (White -Rodgers), and the pump (NRF-22) - from a power inverter. I am interested to know if anyone has any experience doing this. The power requirements seem pretty modest, one thing I wonder is how long I could run off of a fully-charged 12V battery. Why not? Assuming you can get a big enough one. And the batteries to run it. Add up the power requirements of the various bits and pieces (it will be on the equipment) and figure out how long you want them to run for. Then you need to figure out how to hook the inverter in while disconnecting power from the mains. Do not under any circumstance back feed the main from your inverter. You either need to rewire your boiler so you can plug into the mains or the inverter, but not both (which, incidentally, will not meet code and may be illegal -- and check the grounding) or get a transfer switch. I run my 80K BTU mod-con, an alpha, a 15-58 pump (for the indirect) plus 3 taco ZV's amd a 40VA 24VAC transformer off a 1500VA Pure Sine Wave inverter. The Inverter monitors connected load and displays run time based on it's battery condition and load. Mine usually hovers between 120 and 122 min run time with the above devices connected. Get a Pure Sine Wave inverter or UPS, much better for your equipment. The UPS is a good suggestion if I were to want unattended backup. Also I read that a pure sine wave converter is needed if you are going to be running a motor. Definitely go with a pure sine, your electronics will thank you. And that transfer switch will work. one thing I wonder is how long I could run off of a fully-charged 12V battery. Here's what I did, once I had the same question as you so I rewired my boiler so I could monitor everything from a kill-a-watt device. My system had the mod-con, three 15-58 pumps (boiler, DWH, system), 3 taco ZVs, and a pump for condensate. The kill-a-watt device was useful because the load was not constant, overall it was about 1.4 to 1.7 kWh per day (depending on the outside temp), max load was around 200-220 VA. So in my case the battery would need to be 1.5 to 2 kWh in order to fully run the system for 24 hours. I have my boiler set up to be connected to a pure sine wave inverter, fed from my car's 12-V battery. When my battery begins to become depleted, I can run the car's engine to recharge. If my car starts running low on gas, I can drive to a gas station that still has electric power. I have a double-pole, double-throw switch to select between utility power and backup. I've tested the whole setup, but haven't had to use it in an emergency. Idling your car for hours to serve as a generator is probably bad for the car itself. If you are handy and have a larger battery, you could get a split phase inverter and connect it to a 120/240 transfer switch (4- prong) , then wire the switch to a double pole breaker on your panel, this way if you have an outage both legs on the panel will be powered, of course you need to be prudent when turning things on as not to overload the battery. A simpler way would be to use single phase for the inverter and switch, and rearrange your breakers so that the most essential stuff are on the same leg. The bottom line is that you have to know what you are doing, like you must shut off the main breaker (w/ interlock kit) before you backfeed the panel. First you need to figure out your electrical needs. You lose a bit in the inversion process so let's call it 15 a/h. A typical 12 volt deep cell battery is rated for 200 a/h. In reality, you should only count on getting about 100 a/h. On a single battery, you could expect about 7 hours of run time with the system described. 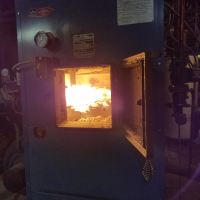 Keep in mind that the boiler does not run all day. You can always group a few batteries together if needed. A less expensive way to connect up to the Boiler is to completely isolate the inverter/battery from the mains and connect the batts to a good quality charger 24/7. That way no feedback into the grid, which can be exciting for linemen repairing down cables. Written from a restaurant on the beach in Mexico sorry. I figured out that to run four Taco 007 circulators (at most three on at a time) and the electronics, I would need a pretty big UPS. And I have had the power go off here for six and a half days straight in the last few years. It takes a really big UPS for that, so instead, I got a whole-house natural gas fueled backup generator instead. It cost a little less than my mod-con. It will run all my lights, my hi-fi, my computer (that is on a big UPS that could run the computer for two and a half hours, including the router) and even my electric stove (provided I do not use the oven). About pure sine wave outputs. Modern day electronics do not require this. Most power supplies these days rectify the line voltage down to DC, and then run it through solid regulators to provide the electricity the electronics. But most motors prefer sine wave power. Anything else tends to make them overheat. I suspect ECM motors do not need sine wave power to operate, but I would check with the manufacturer before trying it. In the early '80's ran the numbers for NG generators for household use in San Diego area & no longer remember the break even period, but remember being surprised at how soon the set up would pay for itself. Kind of where I came to, @Jean-David Beyer -- except I don't have the convenience of natural gas. Two nice big (one elderly, but still runs) 20 KW gasoline fired generators for the days when the power isn't. It's nice not to have to worry about which circuits can -- or can't -- be run! Have a propane or gasoline Kohler 7.5KW genset 220/110 V. Continental 4 cyl eng. Which I may decide to sell in August. I seem to remember an automobile manufacturer (Honda? Fiat?) made a little co-generation system. It was their water-cooled engine from a smaller car, slightly redesigned for this kind of duty. The cooling water was used to heat the house, so the efficiency of the engine was not as important as if used to move a car. And since the shaft was going around anyway, they stuck an alternator on there to supply electricity to the house. Not a novel idea, but interesting that it would be commercially effective on such a small scale. I recently bought a cheap-o 2kw generator from harbor freight. Very quiet, sips fuel. About 1/2 the price of the big name small RV sized generators. My neighbor has had one for years, no problems. I've found all sorts of uses for it. It may be less $$ than a battery and inverter. Not sure about code issues, but my boiler system is on a rubber cord, plugged into a wall plug. I plug it into a cord, move the generator 50' from the house or shop to be safe. > Idling your car for hours to serve as a generator is probably bad for the car itself. > I seem to remember an automobile manufacturer (Honda? Fiat?) made a little co-generation system. It was their water-cooled engine from a smaller car, slightly redesigned for this kind of duty. The cooling water was used to heat the house, so the efficiency of the engine was not as important as if used to move a car. And since the shaft was going around anyway, they stuck an alternator on there to supply electricity to the house. Not a novel idea, but interesting that it would be commercially effective on such a small scale. It was a natural gas powered Honda motor that was used and generated electricity. It was called Freewatt. I looked into it a few years back but it wasn't available outside of the northeast U.S. at that point. Disappointing, I thought it was a good idea. CoGens typically only pencil out if you have a large, consistent thermal load. I would look at that load first, it rarely exists in summertime residential uses. My first thought for coven applications would be brew pubs, distilleries, water parks. Applications that need constant DHW production. It seems to do what I would like in that it would run the boiler off line voltage, switch over to the inverter on power loss, and switch back when power is restored. turn on the inverter when power fails -think this could be done with a relay. We got through the sub-zero temps with no power loss here but this is something I still want to try and get working. Run the grid power through a normal closed relay, and the inverter through a normal open relay, when the grid shuts down the closed relay opens and the open relay closes turning on the inverter. Should be inexpensive and simple to wire. For 1+kw load I'ld get a small gen 1-2 kw, (and ~ 55 gal barrel of fuel if your going to run a week continuous). Gravity feed engine if have to, or ~3 psi gas pump. Nat gas/propane is easier if have it. Likely limited energy in a car bat won't power it long. Need larger bat if have oil and FHW load. Run the numbers. Know a guy that has bat bank of eight 6 V large car bats (48V) $$$ and inverter. He can run fridge TV, gas FHW heat and a few lights for the night till need to start the gen next day. Fuels like gasoline store a LOT more energy than bats in same space. When using a car's regular alternator to make 12V power a hidden gotcha is fuel consumption. 1kw to a car engine will be considered no-load , no-load fuel consumption scales with engine size. 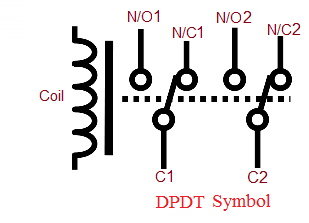 Or just use one DPDT relay... the grid would go to the NO contacts, the inverter goes to the NC contacts. Grid power energizes the pull-in coil which lets current flow from the NO contacts to the common contacts. Grid goes down, relay opens routing current from the inverter NC contacts to the common terminals. A word of caution: either relay solution must -- repeat MUST -- be set up as a break before make device. This does two things. A minor (?) one is that it prevents your device from electrocuting the person trying to repair the power line. A more significant one is that it prevents a potential very high current out of phase connection, which would blow your inverter or whatever to kingdom come. Agreed, that's why someone were left wondering why they were still out power when it's back for the neighbors. I have a light wired ahead of my main, fused at 15A. Turning it on is part of the generator operation sequence with my manual transfer switch. When that light comes on I know the grid is live and I can go back to utility power. Beats looking out the window to see if the neighbor's lights are on. @NY_Rob, am an armature so did not know you could buy one relay to do both jobs. Of course one assumes that any assembly would be thoroughly tested for safety and unable to feed back into the grid. Only if it is labelled for UL/CSA compliance as a transfer switch device. ^ the nice thing is with a DPDT relay it would be pretty much impossible to feed the inverter output back into the grid. By design only one set of contacts can be closed at any time. I use a 50 amp DPDT relay to charge my Chevy Bolt (Electric Vehicle) it will easily handle the 32amp draw from the Bolt all day long if needed. 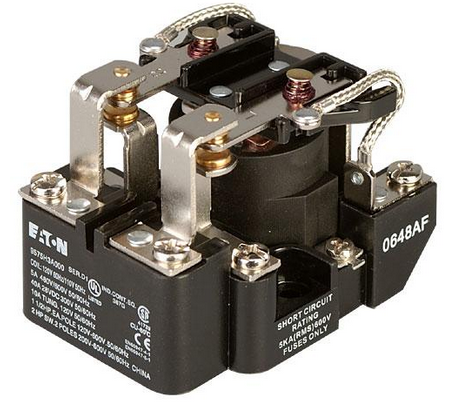 Just to be hyper careful, a relay like you are talking about can arc when switching. Low probability, but a switch designed for protecting the guy repairing the power line is still a better approach. Usually when a lineman is on the job, he would wear protective gear to avoid being electrocuted if any backfeeding were to happen, or at least greatly reduce that chance of that happening. And if there's a backfeed, a device is hooked up to trigger the OS (Oh Sh*t) response in the brain. All true. And at least around here there is an additional safety -- once the line person gets up there, they ground the lines they are working on, if they can (and there goes your inverter!). But they can't always do that. Who wants to take the chance? That is true. But unskilled humans will not be linemen. A couple of years ago a power line fell on the road in front of our house. A couple of people decided to pull it off the road. They lived. Same road. Yes we have a lot of downed power lines. A resident was having a party. Guests instructed to just wend their way through the tree and don't step on the wire. I followed the line far enough up the circuit to be sure the line was dead from the feed direction. People do not understand the potential flow of power through wet surfaces (e.g., the road), wood (as in tree), and anything else to some distance from the actual power line. Another downing about 1/2 mile away on a main road. Tree down with power line. I stopped and flagged down cars apparently not sufficiently perceptive so they did not run into the tree. There was room to get past the tree, but not the wire. One of the drivers decided he was too much in a hurry and went to pull the wire off the road. And this is just from a minute sample. Many (if not most) people simply do not understand electricity. If these ignorant people play with downed lines, convinced the line is dead, they are people that can be zapped by a poor generator connection or fast spark. Not to mention a line breaker trying (in vain) to restore the circuit. And I do understand the odds are very low. I would still recommend the proper break-before-make switch made for the purpose. I remembering seeing lineman doing repair on high voltage (500kV) line by dangling on a helicopter, the pilot was equally impressive because he had to counterbalance the weight of the helicopter against the weight of the lineman's balls. You can be held liable if you backfeed power from your home to the grid and someone gets hurt/killed. I have done some line work. It is always grounded before any work is performed, that said, you ate still relying on that ground wire being good. The induced voltage alone on a polyphase line can kill a person. They now sell a device that alerts you to when utility power comes back on . It's basically very similar to handheld device that finds AC wiring in walls. Except it's designed to mount into knockout hole in breaker box. No electrical attachment to incoming main ~ 100+ amp leads. Just wrap an insulated wire around one incoming ~ 100 amp feed. ( on meter side of transfer switch or interlock ). Capacitive coupling does the rest. Buzzes when utility power comes back on, uses 9V bat. Pretty useful and easy to install. Great suggestions, lots to think about, thanks for all the input. Anything I do for the interface to the main power will be through a UL-approved device. My main consideration is to have something in place that I would monitor and control just to run the boiler should there be a power outage for a limited amount of time. A fully automated backup is something I might consider at a later date (e.g. generator solution) if for example I was to be out of town during the winter.